Used 2012 Yamaha Zuma 125 Scooters in Elkhart, IN | Stock Number: 091590. Ready to Zoom. The biggest Zuma brings it all into the modern era with a clean, fuel-injected four-valve engine that cranks out plenty of power. With its telescopic front fork, fat tires and rugged attitude, the Zuma 125 is designed to get you and a friend there for years to come. Two bright halogen headlights light the way—following current sportbike practice, the left side provides the 55W low beam while the right side is the 60W high beam. For extra security when parked, the main switch is equipped with a key hole lock cover. The underseat storage compartment’s cavernous 5.2-gallon capacity is roomy enough for a full-face helmet. The Zuma 125’s easy-to-read analog speedometer is flanked by a fuel gauge and indicator lights. Hefty steel-tube frame has a step-through design for easy mounting. A two-stage electrodeposition and electrostatic painting process provides a durable, corrosion-resistant finish. Telescopic fork features beefy outer tubes for strength, while slider shrouds help protect the 27 mm inner tubes from debris. Swingarm has double rear shocks for riding comfort on the street and unpaved roads, too. Fuel tank holds 1.6 gallons for plenty of cruising range. Fuel tank emission system includes a charcoal canister to control gasoline evaporation and reduce air pollution. 220 mm hydraulic front disc and rear drum brakes combine for serious stopping power. Zuma provides both a centerstand and side stand for parking convenience. Zuma’s fuel-injected, 125 cc single cylinder, 4-stroke engine pumps out lots of power for its size, using an SOHC 4-valve head with 10:1 compression ratio and ceramic-composite cylinder plating. For reliability and easy maintenance, simple wet-sump lubrication is used. The centrifugal oil filter built into the crankshaft means there’s no messy oil filter to replace. Forced air cooling system helps keep engine temperatures under control, even while idling at stoplights, for maximum efficiency and longer engine life. Fuel injection provides the optimal fuel mixture for the operating condition, including temperature and altitude, and that means easy cold starts, too. 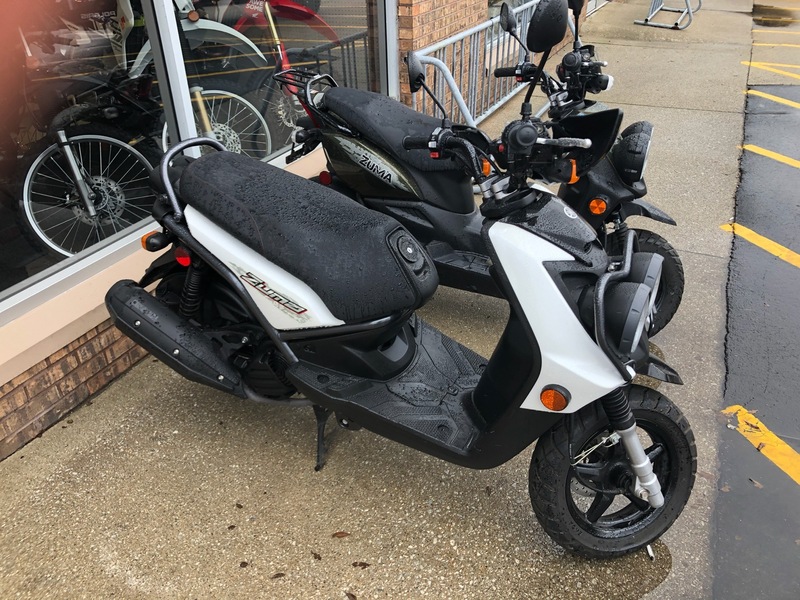 That tough off-road look isn’t just for looks: the strong steel frame; fat, aggressive tires; oiled-type air filters; beefy shocks front and rear and off-road style brush deflectors make this scooter at home on unpaved roads while delivering all the attitude you could want for the street. 125 cc 4-stroke engine with 4 valves, a 10:1 compression ratio, ceramic-composite cylinder plating, and electronic fuel injection gives this new-generation Zuma a new level of performance. Fully automatic C.V. transmission and pushbutton electric starting make the Zuma super-convenient transportation. Both center and side stands, along with a locking cover on the ignition switch, make it convenient to park, too. There’s room for two atop this new-generation Zuma’s seat, and lots of locking storage beneath it. 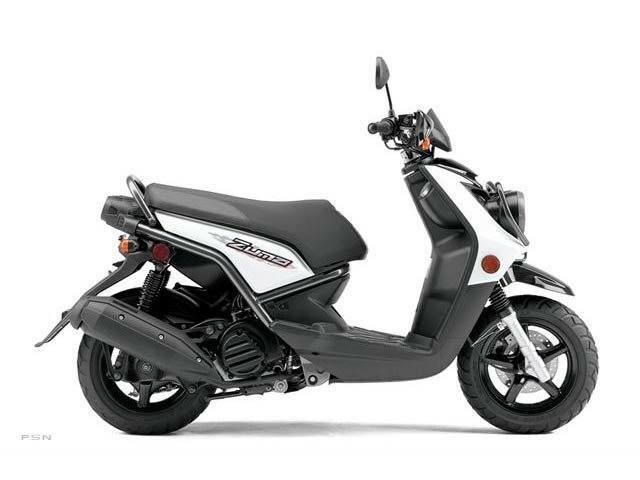 The Zuma 125 achieves fuel economy up to an estimated 89 mpg with a fuel tank that holds 1.6 gallons of gas.